The aim of this study was to characterize of chicken egg yolk immunoglobulins (IgYs) specific as immunotherapy to Mycobacterium tuberculosis complex (MTBC) infection. Lohmann laying hens were immunized intramuscularly with antigenic of MTBC. Egg yolk was separated from egg white, and IgY antibody was then purified by multiple polyethylene glycols 6000 extraction and ammonium sulfate purification steps. The IgY anti-MTBC concentration in egg yolk increased at 2 weeks and it reached a maximum at 4 weeks after immunization. After 6 weeks, the levels of IgY anti-MTBC decreased gradually. The antibody of MTBC was detected and produces a specific line of precipitation in agar gel precipitation test beginning the week 2 after the first immunization. Analysis of results obtained with ELISA showed a significant increase in the MTBC specific antibodies after 2 weeks and reached a plateau at 4 weeks from the booster immunization. Sodium dodecyl sulfate-polyacrylamide gel electrophoresis revealed the IgY preparation to be pure and dissociated into protein bands with molecular weights of 112, 78, 69, 49, and 28 kDa and Western blot analysis shown the presence of anti-MTBC IgY in egg yolks, with molecular weights of approximately 78 kDa. These results suggested that egg yolk could be a practical strategy in large-scale production of specific anti-MTBC IgY for immunotherapy of TBC. Tuberculosis (TB) remains a public health problem and is considered one of the main causes of death worldwide. TB is a disease caused by infection with the bacteria called Mycobacterium tuberculosis. The treatment of TB is substantially more expensive and difficult to treat, with higher rates of treatment failure and mortality. Immunotherapy may also be used as a complementary treatment against pathogens that are difficult to treat with traditional antibiotics. It is hoped that the new immunotherapy and the repurposed drugs that accompany them offer promise for improving the treatment of drug-resistant forms of TB, in terms of both better outcomes and quality of life for patients. An alternative control strategy potentially applicable to TB may involve a passive immunization strategy using hyperimmune, pathogen-specific secretory IgY antibodies. For example, egg yolk IgY antibodies offer a practicable alternative to mammalian serum antibodies because of their feasibility for large-scale commercial production and the relative noninvasive methods used for their preparation., A simple collection of eggs instead of invasive blood sampling and bleeding has an advantage concerning the welfare of the immunized animals. Average volume of egg yolk (15 mL) contains 50–100 mg of IgY, of which 2%–10% can be of specific antibodies, this is a much higher amount of immunoglobulin that could be obtained by bleeding the animal., This evolutionary spread means that there is no immunological cross-reactivity between chicken IgY and mammalian IgG., Due to this evolutionary difference, chicken antibodies will bind to more epitopes on a mammalian protein than the corresponding mammalian antibody. Chicken antibodies also recognize other epitopes than mammalian antibodies. Thus, the eggs of immunized chickens are an economical and abundant source of polyclonal antibody. Immunoglobulin therapy may diminish the development of antibiotic resistant microorganisms., The purpose of this research was to characterize of chicken egg yolk immunoglobulins (IgYs) specific as immunotherapy to Mycobacterium tuberculosis (M.TB) infection. M. tuberculosis ATCC H37 Rv was grown in Lowenstein-Jensen (Difco, USA) at 37°C. Bacteria were harvested by centrifugation (15 min, 3000 rpm), washed three times with phosphate buffer saline (PBS) (pH 7.2), and resuspended in PBS at a density of 108 cells/mL by comparing 0.5 McFarland and cells optical density at 600 nm was recorded. For killing M. tuberculosis, formaldehyde was used at the concentration of 2% (vol/vol), and a suspension was held at 4°C for 16 h.
Lohmann laying hens were immunized intramuscularly with M. tuberculosis ATCC H37 Rv that repeated four times with the dose of each 80 μg of antigen (bacterial protein) of MTBC with an interval of 2 weeks. The first immunizations were antigen mixed with Freund adjuvant complete and subsequently mixed with Freund adjuvant incomplete. Eggs were collected daily, beginning before, and after the first immunizations and stored at 4°C until analysis. A rapid and simple method adapted from previous studies was used to extract IgY from the yolk. Briefly, the yolk was separated from the white by egg separators, and a volume of buffer containing 14% polyethylene glycols (PEG) 6000 (w/v) equivalent to three volumes of yolk was added. The mixture was stirred at room temperature for 30 min and was centrifuged at 5000 g for 20 min at 10°C. The supernatant was collected and filtered through four layers of sterile gauze. The volume of the filtrate was measured, and PEG 6000 was added by gentle stirring to adjust the final polymer concentration to 12% (w/v). The material was centrifuged at 5000 g for 20 min at 10°C. The pellet was dissolved to the original volume of yolk in phosphate buffer, solid ammonium sulfate was added to reach 50% saturation, and the mixture was stirred overnight at 4°C. The precipitate was collected by centrifugation and washed with 33% saturated ammonium sulfate. The precipitate was dialyzed against PBS and freeze-dried, and the powder obtained was stored at −20°C. Finally, the IgY antibodies were stored at −20°C until use. 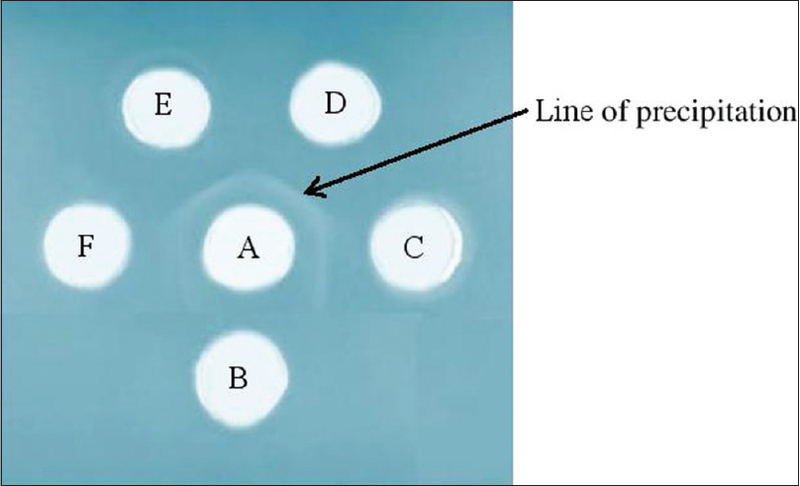 Agar gel precipitation test (AGPT) was carried out on the immunoglobulin Y samples using the methods described by Okwor et al. (2011). It was performed using immunodiffusion plates with 10 ml of 1% agar noble gel containing 8% sodium azide at pH 7.2 ± 0.1. The plates were set up with groups of six wells in a circle surrounding a center well. The peripheral wells were filled with the immunoglobulin Y anti-MTBC samples to be tested, whereas the center well was filled with the MTBC antigen. The plates were incubated at 37°C and read at 72 h under diffused light. The observations were compared with before and after immunization. Positive IgY anti-MTBC samples showed a line of precipitation between the IgY and antigen wells. In brief, wells of Microtiter plates were coated with 100 μl of antigen solution appropriately diluted with 0.05 M carbonate buffer (pH 9.6). After overnight incubation at 4°C, the plates were washed, and 200 μ1 of PBS (pH 7.4) containing bovine serum albumin (1% in PBS) was added to the wells to block the uncoated surface. After being blocked, each well was washed three times with 200 μL of PBS-Tween (PBS-T; 0.85% NaCl - 0.01 M phosphate buffer, pH 7.2) (containing 0.05% Tween 20), and IgY from immunized hens at different time intervals was applied to the well in triplicate for reaction with the antigen for 2 h at 37°C. After each well was washed again with 200 μL of PBS-T, 100 μL of horseradish peroxidase-conjugated rabbit anti-chicken IgG (Sigma Chemical Co.) diluted (1:1000) with PBS-T was added to each well, and the plate was incubated at 37°C for 2 h. Each well was washed again with 200 μL of PBS-T, and then 100 μL of TMB solution with H2O2. The reaction was stopped after 20 min with 4N H2SO4 (50 μl per well), and the intensity of color developed was measured at 490 nm with a microplate reader. IgY anti-TBC titer was defined as the maximum dilution multiple of the sample with an OD. Crude IgY from nonimmunized hens was used as the control. Sodium dodecyl sulfate-polyacrylamide gel electrophoresis (SDS-PAGE) was performed to determine the purity of IgY. A 15% polyacrylamide gel was used with a Mini-PROTEAN 3 cell (Bio-Rad Laboratories, USA). The analysis was conducted under reducing conditions; the sample was mixed with sample buffer and held for 5–8 min at 100°C. Ten microliters of the sample were loaded into each well. Prestained protein standard was used as a molecular weight marker. The protein bands were visualized with Coomassie Brilliant Blue R250 (Fluka USA). The gel was analyzed using Bio-Rad image analysis software. Following SDS-PAGE, proteins were electrotransferred to nitrocellulose membrane in Western blotting transfer buffer by running at 100 V for 120 min. The membrane was blocked in PBS-T 0.05% and added to a solution of powder milk at 5% and left overnight at room temperature with agitation, then washed three times (5 min per wash) in PBS-T 0.05%. The membrane was incubated with IgY from each group diluted 1:5000 in PBS-T 0.05%, in a solution of powder milk 5%, incubated at 37°C for 4 h with agitation. After incubation, the membrane was washed as described above. Afterward, a membrane was incubated at 37°C for 1 h with rabbit IgG anti-IgY (Sigma, Steinheim, Germany) 1:5000 in PBS-T 0.05. The membrane was washed and incubated with A protein (Sigma, St Louis, USA) added to diluted peroxides at 1:500 in PBS-T for 1 h at 37°C with agitation; followed by a final wash, threefold with PBS-T and threefold with PBS. Protein bands were visualized using 5 mg of 3,3-diaminobenzidine tetrahydrochloride in 20 μL of peroxides and 100 μL of COCl2 in 10 mL of PBS. The reaction was stopped by adding distilled water. Data were reported as means ± standard deviation and levels of significance were evaluated using one-way ANOVA with least significant difference test. The differences were considered significant at the level of P < 0.05. The IgY concentration in yolk from eggs before immunizations was 3.71 ± 0.20 mg/ml and was increased during the immunization period. The IgY concentration in egg yolk demonstrated significantly increased beginning the 2nd week after the first immunization was 4.10 ± 0.13 mg/ml and reached the maximum of 4.98 ± 0.28 mg/ml at 4 weeks after immunization. After week 6, the levels decreased gradually to reach a level of 4.84 ± 0.32 mg/ml [Table 1]. AGPT reactions between MTBC antigen and IgY before or after immunization are shown in [Figure 1]. IgY positive anti-MTBC if the precipitation lines from the IgY into the well. One line of precipitation was produced by IgY from 2, 4, and 6 weeks after immunization but not before immunization. The titer of specific activities of anti-MTBC IgY increased after the initial immunization and was detected at 2 weeks after immunization. Following reimmunization, the titer of specific antibodies continued to increase at 4 and 6 weeks after immunization demonstrated significantly higher egg yolk antibody titer than that of before immunization [Table 2]. Analysis of purified IgY by SDS-PAGE identified two major bands of 112 and 28 kDa and three minor bands of 78, 69, and 49 kDa. The electrophoresis pattern of gel filtration found in this procedure was in accordance with the standard IgY showing 112 kDa heavy chain and 28 kDa light chain [Figure 2]. 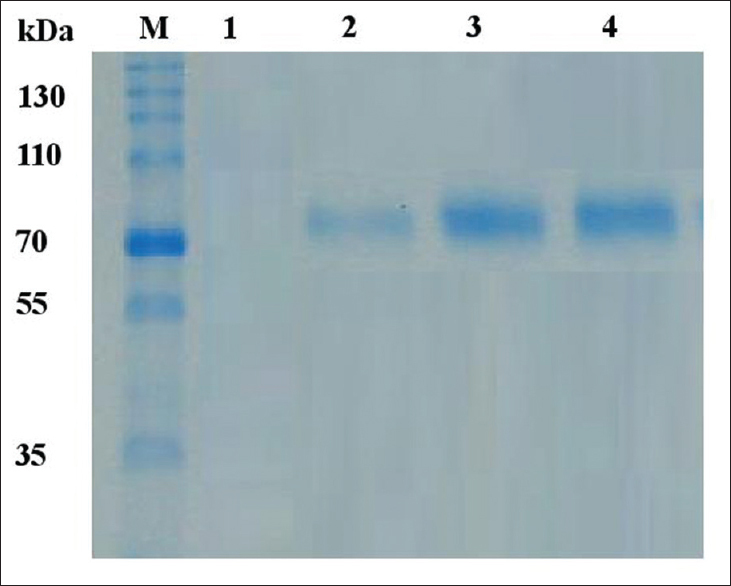 The presence of specific IgY anti-MTBC in egg yolks were determined by Western blotting and its results showed there are single protein band with molecular weight 78 KDa [Figure 3]. These stronger bands were detected in egg yolks of hens from 2, 4, and 6 weeks after immunization, while in egg yolks of hens before immunization were undetectable. In this study, we conducted a PEG extraction method followed by several steps of ammonium sulfate precipitation. The method is simple, efficient, and safe compared with water dilution, chloroform extraction, and gel-filtration chromatography, and therefore, it is suited to a large-scale isolation of IgY from egg yolk. The PEG used in this process, which is of low toxicity and widely used in pharmaceutical research. IgY anti-TBC was successfully elicited by immunizing the hens with formalin-inactivated MTBC antigen emulsified in Freund's adjuvant. The IgY concentration in egg yolk increased during the immunization period until week 6 where it began to increase dramatically at 2 weeks and it reached a plateau at 4 weeks after immunization. After week 6, the levels decreased gradually. These results indicated that chickens require about 2 weeks for antibody production and it also indicates that Lohmann hens, as the host for the production of IgY anti-MTBC, show the remarkable ability to rapidly and efficiently generate an abundant IgY and provide specific IgY in a noninvasive way. The injection of the antigen by the intramuscular route results in higher antibody levels at 4 weeks after immunization, and the resulting antibodies also exhibit higher specificity., Chickens, immunized by the intramuscularly with antigenic of M.TBC, can producing specific antibodies during more than 200 days. Intramuscular immunization shows a higher antibody level from day 28 after immunization and the specificity is almost more than 10 times higher compared to subcutaneous immunization. AGPT reactions between MTBC antigen and IgY after immunization showed that IgY positive anti-MTBC if the precipitation lines from the IgY into the well. One line of precipitation was produced by IgY from 2, 4, and 6 weeks after immunization but not before immunization. The AGPT test was a satisfactory and uncomplicated technique for detecting precipitating antibodies against MTBC. It is a well-known concept that the immune response is more potent when the distance between the antigen source and the immune system increases. The present study was showed the effectiveness of egg yolk antibody (IgY) obtained from hens immunized against MTBC. The increase in the specific antibody concentration of egg yolks from immunized hens over the course of immunization period was monitored by ELISA. The specific IgY titer increased starting the 2nd week after the first immunization, with the titer peaking at the 4th week. After 6 weeks, the antibody titer slowly decreased. The titer of anti-MTBC IgY in yolk at 2, 4, 6 weeks after immunization demonstrated significantly higher than that of before immunization. It indicates that Lohmann hens, as the host for the production of anti-MTBC IgY, show the remarkable ability to rapidly and efficiently generate an abundant IgY and provide specific IgY as immunotherapy. The electrophoresis pattern of gel filtration found in this procedure was in accordance with the standard IgY showing 112 kDa heavy chain and 28 kDa light chain. The molecular mass of the H (78 kDa) chain in IgY is larger than the H chain from mammals (50 kDa). The greater molecular mass of IgY is due to an increased number of heavy chain constant domains and carbohydrate chains. The immunization of chickens provides an attractive alternative to using mammals as hosts for antibody production. The deposition of IgY into the egg yolks of the immunized laying hens then provides an elegant source of polyclonal immunoglobulins., The potential use of IgY in therapy, both in animals and in humans opens up a vast field of interesting and useful applications. 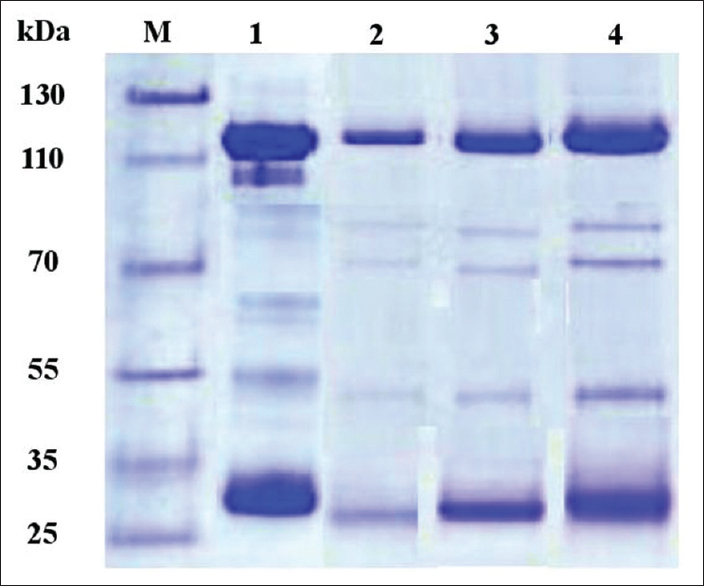 The presence of anti-MTBC IgY in egg yolks was confirmed by Western blotting. IgY obtained from hens at 2, 4, 6 weeks after immunization but not before immunization, showed the stronger bands with a single protein band of molecular weight protein (78 KDa). The results indicated the presence of specific anti-MTBC IgY. The immunization of chickens provides an attractive alternative to using mammals as hosts for antibody production. IgY is the major low molecular weight immunoglobulin in oviparous animals. This type of antibody has distinctive properties which can be exploited in various ways in research, diagnostics, and therapy. One important advantage arises from the phylogenetic distance and genetic background that distinguishes birds from mammals. This improves the likelihood that an immune response will be elicited against antigens or epitopes that may be nonimmunogenic in mammals. The deposition of IgY into the egg yolks of the immunized bird then provides an elegant source of polyclonal immunoglobulins. Since polyclonal IgY can be recovered from the eggs of laying hens for prolonged periods, this approach provides a long-term supply of substantial amounts of antibodies. The results presented in this study indicate that immunization of hens with MTBC antigen could be a strategy to obtain at low cost a relatively high concentration of anti-MTBC IgY egg yolk and could be a useful tool for immunotherapy of TBC infection. Our results also suggest that egg yolk from immunized laying hens may offer a new large-scale source of low-cost antibody. This study was supported by Directorate General of Higher Education, Ministry of National Education, Indonesia. Grants No: 018/Sp2H/LT/DRPM/II/2016, February 17, 2016. World Health Organization. Global Tuberculosis Report 2015. 20 Avenue Appia, 1211 Geneva 27, Switzerland: World Health Organization; 2015. p. 1-145. Spillner E, Braren I, Greunke K, Seismann H, Blank S, du Plessis D. Avian IgY antibodies and their recombinant equivalents in research, diagnostics and therapy. Biologicals 2012;40:313-22. Kumaran T, Citarasu T. IgY-technology: Production of antibodies in chickens and use in therapy of infectious diseases. Int J Sci Res Mod Educ 2016;1:29-35. Dias da Silva W, Tambourgi DV. IgY: A promising antibody for use in immunodiagnostic and in immunotherapy. Vet Immunol Immunopathol 2010;135:173-80. Sudjarwo SA, Sudjarwo EK, Koerniasari. Purification and characterization protein of anti-dengue specific immunoglobulin Y for diagnostic kit of dengue. J Appl Pharm Sci 2012;2:7-12. Ferreira Júnior Á, Santiago FM, Silva MV, Ferreira FB, Macêdo Júnior AG, Mota CM, et al. Production, characterization and applications for toxoplasma gondii-specific polyclonal chicken egg yolk immunoglobulins. PLoS One 2012;7:e40391. Wen J, Zhao S, He D, Yang Y, Li Y, Zhu S. Preparation and characterization of egg yolk immunoglobulin Y specific to influenza B virus. Antiviral Res 2012;93:154-9. Dubie T, Yimer S, Adugna M, Sisay T. The potential application of avian egg antibodies with emphasis on immunotherapeutic and immunodiagnostic purpose. Adv Res J Biochem Biotechnol 2014;1:18-30. Silveira L, Gilberto M, Fischer G, de Lima M, Hübner SO. Avian IgY antibodies: Characteristics and applications in immunodiagnostic. Cienc Rural 2014;44:153-60. Mulvey GL, Dingle TC, Fang L, Strecker J, Armstrong GD. Therapeutic potential of egg yolk antibodies for treating Clostridium difficile infection. J Med Microbiol 2011;60(Pt 8):1181-7. Hirai K, Arimitsu H, Umeda K, Yokota K, Shen L, Ayada K, et al. Passive oral immunization by egg yolk immunoglobulin (IgY) to Vibrio cholerae effectively prevents cholera. Acta Med Okayama 2010;64:163-70. Sudjarwo SA, Nasronudin, Wiwiek I, Giftania WS, Koerniasari. Production and characterization protein of anti HIV specific immunoglobulin Y for immunotherapy. J Appl Pharm Sci 2014;4:30-4. Okwor EC, Eze DC, Okonkwo KE. Comparative evaluation of agar gel precipitation test (AGPT) and indirect haemagglutination test (IHA) for the detection of antibodies against infectious bursal disease (IBD) virus in village chickens. Afr J Biotechnol 2011;10:16024-7. Rajan S, Karthika S, Michael A, Gandhimath. Generation of egg yolk antibodies in chicken (IgY) against Streptococcus mutans and its in-vitro neutralization efficacy. Arch Appl Sci Res 2011;3:404-41. Dai YC, Wang YY, Zhang XF, Tan M, Xia M, Wu XB, et al. Evaluation of anti-norovirus IgY from egg yolk of chickens immunized with norovirus P particles. J Virol Methods 2012;186:126-31. Sui J, Cao L, Lin H. Antibacterial activity of egg yolk antibody (IgY) against Listeria monocytogenes and preliminary evaluation of its potential for food preservation. J Sci Food Agric 2011;91:1946-50. Liou JF, Chang CW, Tailiu JJ, Yu CK, Lei HY, Chen LR, et al. Passive protection effect of chicken egg yolk immunoglobulins on enterovirus 71 infected mice. Vaccine 2010;28:8189-96. Vega CG, Bok M, Vlasova AN, Chattha KS, Fernández FM, Wigdorovitz A, et al. IgY antibodies protect against human Rotavirus induced diarrhea in the neonatal gnotobiotic piglet disease model. PLoS One 2012;7:e42788.